In September 2007, the Federal German Ministry for Education and Research (BMBF) launched a foresight process in order to sustain Germany’s status as a research and education location. The BMBF Foresight Process aimed at 1) identifying new focuses in research and technology, 2) designating areas for cross-cutting activities, 3) exploring fields for strategic partnerships, and 4) deriving priorities for R&D policy. “The BMBF Foresight Process”, subtitled “Implementation and Further Development of a Foresight Process”, started by assessing present-day science and technology and was broadened to look into the future over the next 10 to 15 years – and even further. It took into account the developments at the national as well as international level. In order to achieve the targets, a tailor-made combination of methods was applied. Since there is not one single methodology as in a simple input-output model, a combination of methods, as is standard in most foresight processes worldwide, had to be used to meet all four objectives (see Figure 1). These objectives were defined by the BMBF when launching the call for tenders. Objective 1 is to identify new focuses in research and technology that the BMBF must address. Objective 2 is to define interdisciplinary topics and areas, accordingly, that require broader attention and are to be tackled by various departments and groups of actors. The fields thus determined have to be addressed by different partners in the innovation system (strategic partnerships) over a longer period of time (objective 3), and measures should be devised to promote the fields in question (objective 4). In order to achieve objectives 1 and 2, the foresight approach applied well-known search strategies as well as other methods from innovation research and international foresight activities alongside new, creative methods. The themes to be investigated at the national and international level were further developed by experts taking into account existing forward-looking road-mapping and strategy processes from the public and private sector. The first phase stressed the national search for weak and strong signals, while the international search was focussed on the later second phase. 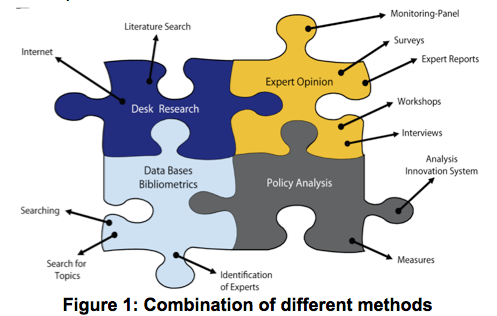 As there is no one single methodology for search procedures, the methods involved quantitative methods like bibliometrics as well as qualitative approaches such as workshops, expert interviews, Internet and qualitative literature searches. A new approach called inventor scouting (identifying young inventors and interviewing them) added to the methodology. For the evaluation of the topics, a set of criteria was drawn up. The criteria provided the basis for an online survey and were also used to guide the selection process. The foresight search activities were flanked by an assessment process. With the assistance of an international panel, latest developments in various technological-scientific subject areas were analysed in order to attain a reliable description of the international “state-of-the-art”. For the monitoring process, an international panel of well-known and acknowledged experts in their fields was asked about the current state and new developments in research and technology. In a second wave nearly one year later, they were once again interviewed to consolidate their opinions and give feedback on potential topics for the BMBF that met the objectives. The topics to be identified were supposed to still be in the research or development phase. Topics that can be expected to either enter the implementation phase during the next years or be transferred to innovations in the next ten years were excluded from the lists of topics to be considered. For a first selection, a set of criteria was developed together with the BMBF. The topics were reformulated, internally assessed and re-assessed several times via an internal database and scientific papers. To provide input to the first workshop in November 2007, a first set of scientific papers describing the developments in the fields was written and distributed as a basis for the discussions. Topic coordinators (sometimes two persons) were nominated for every field that were responsible for defining and working out the details in the respective fields but also for coordinating with other topic coordinators in areas of overlap. The topic coordinators not only scrutinised the future themes but also the innovation system and identified the actors in the fields in question. A bibliometric analysis provided further input into this process. The topic coordinators defined key words for a stakeholder analysis. The key words were used for counting literature indexed in the Web of Science and for a qualitative analysis. The (Internet, literature and other) searches and first selection processes were complemented by expert interviews and informal talks to gain an impression of the importance and potential impact of the huge number of topics under consideration. Topics in which BMBF or German research institutions were already very active at that point in time were labelled ‘golden’ and in most cases were no longer pursued. The second phase of the searches ended with a first assessment of the topics found. An online survey among experts from the German innovation landscape was performed in September 2008 for a broader assessment of the topics, their importance and their time frame. In parallel, the corresponding innovation systems were analysed in order to identify candidates for potential strategic partnerships, which were to be proposed in 2009 at the end of the whole process (objectives 3 and 4). In the last phase of the process, recommendations for R&D policy were also derived. The last phase ended with a conference. It marked the beginning of integrating the topics thus identified into the German innovation system and the BMBF agenda. It was a bridging conference rather than a final act. The workshop participants differed widely (experts from science, society and the economy), and various channels of surveying were used: “experts” and “laypeople” via the interviews, young persons by inventor scouting, and a wide range of persons with broad or specific knowledge through the online survey (more than 2,659 persons). The international monitoring panel consisted of about 35 persons. In the process, 14 established future fields were worked out in detail. They were derived from the German High-tech Strategy. In these fields, future topics were identified, re-clustered and assessed via a set of criteria. Seven new cross-cutting fields were arrived at by clustering the most important issues from the established fields. They are rooted in science and technology but have major impacts on society and the economy as well. Human-technology cooperation: This new future field provides an integrated research perspective on the complex interplay between human and technological change. In view of our increasingly dense technological surroundings and the expanding technical structure of human life, novel configurations of humans and technology must be embraced in all their complexity. Technological innovation can only be achieved in connection with a deep understanding of human thought, feeling, communication and behaviour to provide a new quality of seamless human-technology cooperation. A re-orientation of human beings against the background of technological change is therefore just as central as reviewing the concept of the machine in terms of new machine agents. Further research must cover the relationship of these two parties, whether in the form of human-technical teams or in the wider perspective of human-machine culture. Deciphering ageing: Ageing continues over our entire life span and is a multifactorial process. Some ageing processes cause disorders or disease. The biological processes of ageing and brain development (e.g. changes to neuroplasticity) that occur over the course of a lifetime have so far only been partly explained. Future findings in the areas of cellular and molecular developmental biology will provide new insights into cognitive, emotional and psychomotoric processes. Sustainable living spaces (the field “infrastructures” was split into “water infrastructures” and “infrastructures for human living spaces”): Living spaces will in future be different in terms of structure and organisation. Driven by the reorganisation of ways of life and technological possibilities, chronological, spatial residential, and living patterns are changing. Together with demands for sustainable spatial development, these changes require innovation and adaption in various research areas. In order to react to continuing social trends in the long-term, settlement-structural concepts will have to be made more dynamic to better manage basic conditions and, for example, flexible, more environmentally friendly spatial and settlement structures will have to be established. Efforts to meet these demands, which are still in flux, are obstructed by current settlements and infrastructures, which can only be changed at high cost and involving a considerable expenditure of resources in the short to medium-term. All infrastructures, for providing energy, transport, water and even information and communications, must be made more flexible at a technical level, and the possibility of reconstructing or dismantling them in the future must be taken into account at their construction. ProductionConsumption 2.0: This future field aims at establishing long-term sustainable production and consumption paradigms and involves research into new ways of supplying products and services according to need in the face of changing global conditions. At the same time, it addresses one of the greatest challenges of the future: maintaining the ecosphere, which is also vital to human survival. Research in this area focuses on sustainable industrial and social patterns of materials usage. Researchers in established areas in production research, services research, environmental research, biotechnology and materials sciences are all working with great drive on aspects of sustainable practices. However, they alone cannot adequately accomplish the necessary systemic transformation of the entire structure. Modelling and simulation: New methods of handling complexity based on modelling and simulation require multidisciplinary approaches. Working out the similarities in different applications may be a first step toward adapting the instruments and tools in other disciplines so that new simulations are possible in the future, even in technical and social science contexts. Time research: Time is a bottleneck factor in many developments. Research into time is a central aspect and includes issues such as the chronological order of complex processes in making applications faster and more efficient, cost-effective and intelligent, or in paralleling and synchronising processes (e.g. Internet servers, production processes). The issue of dynamic and chronological development on various time scales, especially of non-linear processes, can only be dealt with in the long-term. One very dynamic future topic within time research is chronobiology, an area in which there are already initial findings on precisely-timed medication delivery. A central research aspect of time research is understanding and being able to specifically control the factor of time with the help of time efficiency research, the precise measurement of time (e.g. for GPS applications, such as precision agriculture and the remote maintenance of machines) and time-resolution (e.g. 4D precision). Energy solutions with a) energy concert: Securing an affordable, safe and climate-compatible energy supply is a central global challenge and an outstanding leading future market with high relevance for the economy and quality of life and a powerful, influential impact on many research fields. Sustainable, coordinated solutions for production, distribution and use are all equally important in this context. But there is still a cacophony. As many actors are involved and many disciplines contribute, energy is a field that needs a symphony. b) Energy from the environment: Energy harvesting is already known, but its use limited. New ideas are expected that make it possible to harvest energy from different kinds of environments and transfer it to miniaturized machines. This is especially necessary for devices that are out of reach (implants, built-in domestic appliances and others). How can future issues and topics with a time horizon of 10 to 15 years and longer be rapidly and efficiently absorbed into an existing innovation system? How do organisations or companies in other countries deal with cross-cutting issues and future topics with a time horizon of 10 to 15 years and beyond? New approaches in innovation policy are necessary to implement and realise new cross-cutting fields of the future. The approaches vary and need to take into account the different stakeholder groups involved. Therefore, in the last phase of the foresight process, the actors of the current innovation system were identified and potential actor groups named who could further foster the different topics or fields. The results of the BMBF Foresight Process were presented during a conference in Bonn in the presence of the Undersecretary of State, high-ranking persons, decision-makers and interested experts. Two hundred persons participated in this conference held at the former parliament building. Part of the conference was organized into so-called “topic islands” where the new fields were presented and discussed in an interdisciplinary manner. All topic islands had a different programme, and the participants were free to choose where they wanted to go. The discussions were very lively. Talks in BMBF revealed large interest in the new fields so that follow-up activities were launched. The first such activities were “follow-up workshops” to bring together different BMBF departments and enable them to exchange views. In 2010, the BMBF started strategic dialogues as an opportunity for looking into the new future fields of the BMBF Foresight Process from different perspectives. This is necessary, on the one hand, for the further development of content and, on the other, to ensure that important aspects are included in the integration and translation of results into funding policy at an early stage. Another policy result is the foundation of a new division (Referat 524 – Department 524) at the BMBF in June 2010, which has been named “Demografischer Wandel; Mensch-Technik-Kooperation” (Demographic Change; Human-Technology Cooperation). Cuhls, K.; Beyer-Kutzner, A.; Bode, O.; Ganz, W.; Warnke, P.: The BMBF Foresight Process, in: Technological Forecasting and Social Change, 76 (2009) 1187–1197. Cuhls, K.; Ganz, W; and Warnke, P. (eds. ): Foresight-Prozess im Auftrag des BMBF. Etablierte Zukunftsfelder und ihre Zukunftsthemen, IRB; Karlsruhe, Stuttgart 2009 (Original in German), www.isi.fraunhofer.de/bmbf-foresight.php. Cuhls, K.; Ganz, W. und Warnke, P. (eds. ): Foresight-Prozess im Auftrag des BMBF. Zukunftsfelder neuen Zuschnitts, IRB (Original in German), Karlsruhe/ Stuttgart 2009, www.isi.fraunhofer.de/bmbf-foresight.php. Cuhls, K.; Ganz, W. and Warnke, P. (eds. ): Foresight Process – On behalf of the German Federal Ministry of Education and Research (BMBF), Report, New Future Fields; Karlsruhe, Stuttgart 2009 (English version), www.isi.fraunhofer.de/bmbf-foresight.php.